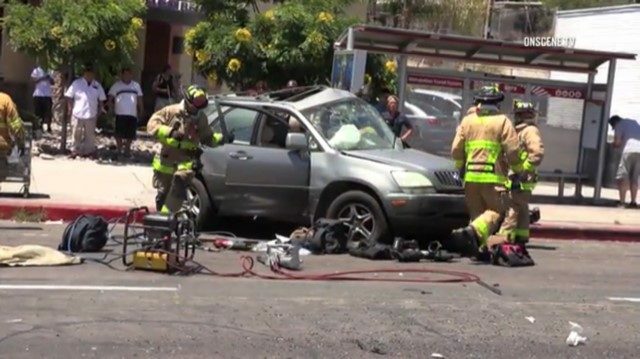 Five people were hospitalized, one with a major head injury, after a 23-year-old driver collided with multiple cars in an intersection in the El Cerrito neighborhood. The series of events happened shortly after 1:35 p.m. Sunday near the intersection of University Avenue and College Avenue, San Diego Police Sgt. Michael Tansey said. The incident began when a 23-year-old man driving a Toyota Camry was involved in a minor collision in the 5400 block of University Avenue, Tansey said. The man failed to stop and identify himself and continued eastbound on University Avenue before moving into the right turn lane for southbound College Avenue, Tansey said. The man then ran a red light and struck the side of a Lexus SUV headed northbound on College Avenue, causing the Camry to spin and collide with a Ford Focus driven by a 23-year-old man with four passengers in the car, Tansey said. A 37-year-old woman driving the SUV suffered a major head injury and a passenger in the Camry suffered major injuries to the jaw and pelvis, Tansey said. Four passengers in the various vehicles involved sustained minor injuries, Tansey said. A total of five people were transported to local hospitals for treatment. Alcohol or drugs were not believed to be factors in the collisions, Tansey said. Traffic division officers were investigating the collisions.